Allstream Business Inc. and/or Allstream Business US, LLC. through its subsidiaries (“Company”) has adopted the following Policies and Procedures related to our PS/ALI Policy. The emergency services industry has expanded capabilities for faster emergency response, including a service called PS/ ALI (private switch/automatic location Identification). PS/ ALI is a service that allows users of multi-line telephone systems, like PBXs, to directly control and update the location information of their telephone stations in the 911 database. Vendors offering PS/ ALI service provide electronic portals enabling direct Customer updates or managed update services. PS/ ALI improves emergency response with more accurate location information when 911 is dialed. Company refers all PS/ ALI requests to outside third party providers. I want PS/ ALI service. What do I do next? PS/ ALI provider is chosen, that vendor works with the Customer to map station locations, setups the 911 update capability & coordinates with Company’s Corporate 911 Administrator. Company provides one emergency response location per trunk group for T1 based services and one per line for analog services. If more than one emergency response location per trunk group is required, a PS/ALI solution must be implemented. Company refers PS/ALI to other providers. 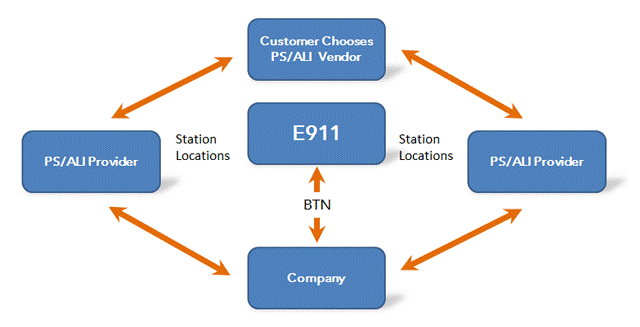 Typically PBX owners (actually any multi-line telephone system owner) implement PS/ALI to ensure that the location of each station is identified to the 911/E911 system. For Basic Business Lines – Company programs the emergency response location to be the service address of each line. For any T1 Business Line Service – Company programs the emergency response location to be the service address of each line. 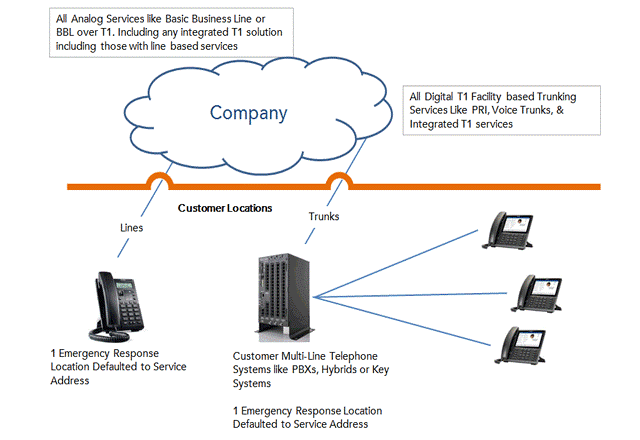 For Basic Business Line over T1 – Company programs one emergency response location to be the service address for each line. For Basic Voice Trunks or PRI Voice Trunks – Company programs one emergency response location to be the service address for each circuit. Company refers all PS/ALI to third parties. If Customer implements PS/ALI, Customer must coordinate with the Company corporate 911 Administrator to ensure station identification pass-through is enabled; otherwise, the Company default actions outlined above will remain in place.